Close on the heels of Set V came Set VI, published in 1903. Taken from Edmund Jones’s translation of Mynydogg from Welsh Lyrics of the Nineteenth Century (1896), When comes my Gwen was completed on 24 December 1901 and dedicated appropriately to Gwendolen and Harry Plunket Greene as a ‘Christmas box’. At first the song would seem to belong to the drawing-room (albeit a highly sophisticated one), but in the final verse Parry lifts it onto a different, elevated plane, by shifting from E flat to the dominant of D. The recovery back to E flat, by way of a series of masterly progressions (‘Her loving eyes Reveal the skies’), also demonstrates Parry’s ability to handle chromaticism with ease. Parry’s setting of And yet I love her till I die (anonymous from Thomas Ford’s Musicke of Sundrie Kindes of 1607), a text highly popular with later English song composers, must be one of the first important interpretations of the poem. AAB in design, the simple diatonic progressions are most affecting, especially in the delicious closing words ‘till I die,’ a gesture that lingers in the memory. ’Tis like I cannot tell what. It is and yet it is not. No man knows which way to find. Hang him and so let him go. The sardonic Love is a bable, an anonymous lyric from Robert Jones’s The Second Booke of Songs and Ayres (1601) is a humorous scherzo-like ditty which makes amusing use of pauses and mock seriousness. Under the greenwood tree, sung by Amiens in Act II Scene 5 of Shakespeare’s As You Like It, was also an extremely popular text for many British composers; one thinks particularly of Gurney’s wonderful setting and others by Quilter, Coates, Howells and Walton. 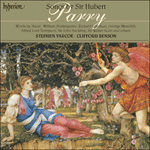 Parry’s interpretation is a skilful stylistic amalgam of archaisms, notably in the two-part canonic writing and a hint of pseudo-Tudor polyphony in the refrain (‘Here shall he see No enemy’). But once again it is the imperative of organicism and developing variation that drives the song. By way of illustration, Parry takes the feminine cadence at the end of the canon and uses it as the more dissonant basis of the second verse (‘Who doth ambition shun’). In addition, the first part of the refrain, which lays emphasis on winter as the enemy of life in the forest (‘but winter and rough weather’), is given keener accentuation in its repeat owing to Parry’s harmonic divergencies.